Drums are rolling for this one. 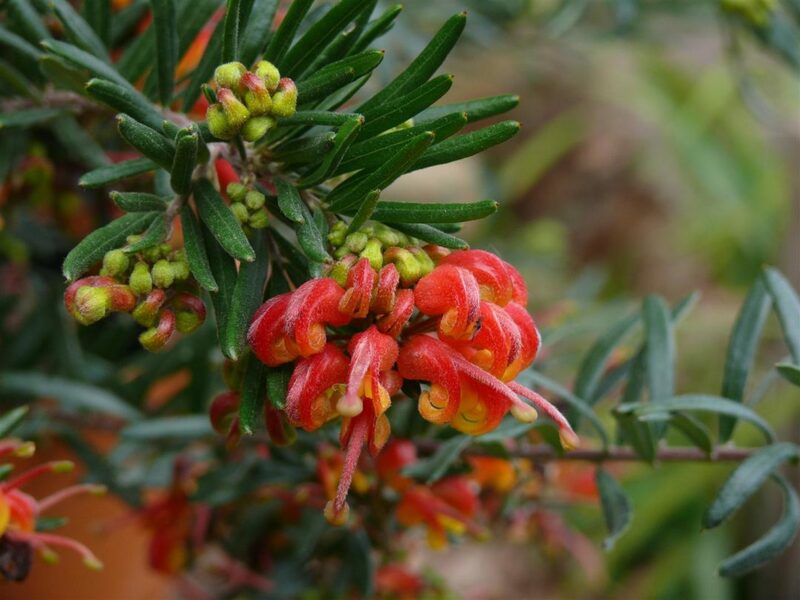 Bred by Austraflora as an offspring of Grevillea Bonnie Prince Charlie, eyes popped when the first flowers appeared ~ you could just about hear the bagpipes wailing and see the plaids waving through the glens. Bright orange, scarlet and gold clusters like cairngorm brooches weigh down the ends of the stems of dark green foliage. Spinebills especially love it and it’s a sight to see them hovering at the nectar-rich flowers. Add to all that a small compact habit that is perfect for containers, mixed beds, borders and edging, and for real drama, mass planting ~ and the boxes are all ticked. 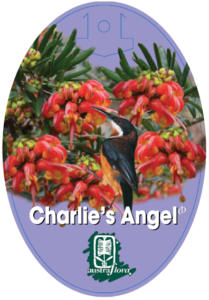 Provide full sun or light shade and well drained friable soils, and Grevillea Charlie’s Angel will grow in cool temperate to semi arid climates; light to moderate frost won’t be a problem, and coastal gardens will also suit. If you can bear to trim the flowers for posies indoors, that is the best form of pruning. Buds and more buds will follow.